Prime Minister's chief science advisor Sir Peter Gluckman, Prime Minister Bill English, AL Rae Centre chief scientist Professor Dorian Garrick, Massey Vice-Chancellor Professor Jan Thomas, and chairman of Norman FB Barry Foundation John Smith. Massey University’s AL Rae Centre for Genetics and Breeding was launched last night, bringing world-leading New Zealand scientist Professor Dorian Garrick home to lead it. The centre is named in memory of one of the founders of modern animal breeding, Massey Professor Alexander Lindsay Rae (1923-2009). It required a substantial investment to fund its proposed activities in addition to a pre-eminent scientist to build its reputation on. The funding came in the form of a $250,000 gift from The Norman FB Barry Foundation, which enabled the funding of four PhD scholarships, one postdoctoral fellow, two eminent visiting scientists and funds for workshops. Co-director Massey’s Professor Hugh Blair has been key in driving the project. “We cannot stress the importance of those funds to what we seek to do. The country’s top students have been enticed away from discovery science in genetics because of greater salaries in banking and other agribusinesses areas. Low salaries for PhD students in New Zealand has resulted in more attractive opportunities for these talented people elsewhere; either completing their PhD studies overseas or going directly into employment in New Zealand. The centre will take up residence in AgResearch’s Ruakura Research Centre, away from the University’s three campuses, but closer to the industries it seeks to collaborate with. Professor Garrick has been integrally involved in the development and implementation of national animal evaluation programs, performance recording databases and breeding schemes around the world. “With Dorian at the helm and the considerable expertise at Massey to support him, we hope that the missing years of research can be bridged by the research that results,” says Professor Blair. This will be the scientific focus of projects at the AL Rae Centre. Work will be applicable to a wide range of traits and species and may comprise large pedigrees of millions of animals. It will leverage influential ancestors having next-generation sequence data to make inference using state-of-the-art Bayesian statistical methods such as Markov chain Monte Carlo sampling. 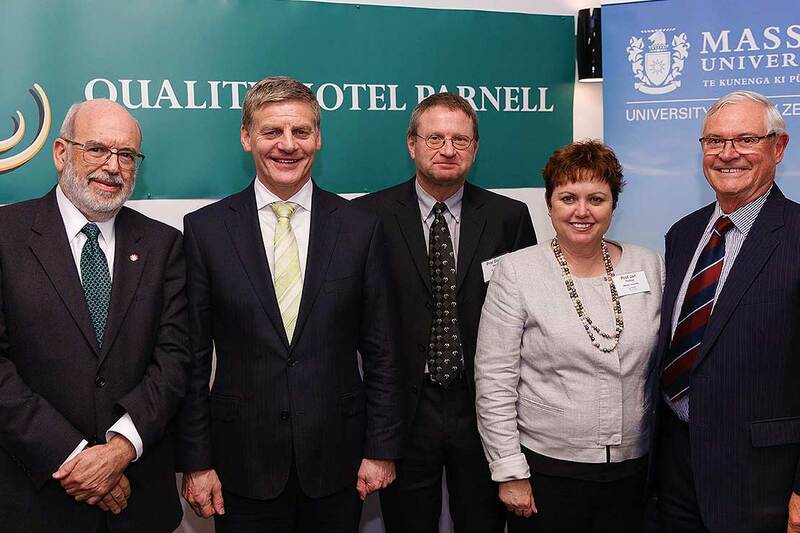 The launch was held at the Quality Hotel Parnell in Auckland, owned by the Norman FB Barry Foundation, a charitable trust set up after the passing of the Hotel’s Founder and Owner, Norman F B Barry in 2007. Professor Garrick received a First Class Honors degree in Agricultural Science from Massey University in 1981 and a PhD from Cornell University in 1988. He was one of AL Rae’s last PhD students. He held the inaugural appointment to the Jay Lush endowed Chair in Animal Breeding & Genetics at Iowa State University for 10 years from 2007, which has special significance as Jay Lush who was AL Rae’s PhD supervisor. Prior to this he spent 5 years at Colorado State University and 15 years at Massey University where he held the AL Rae Chair since 1994.